Cine to DVD or computer files? Cine to DVD conversion Sussex or Digital computer files? Am I better off having my cine to DVD conversion or computer files for editing? This is the question that I get asked on a weekly basis. My general answer to this question is what are you looking to do with your cine film conversion? Are you looking to just watch the films on your Television and home computer or do you wish to edit your cine to DVD transfer? If I have my cine films transferred to DVD can I edit them afterwards? How does Ripping software work? On the Apple platform there is software called DVDXDV, which gives you option as to what file format you want your cine to DVD converted too. Depending on the video editing software being used the video file formats I would recommend are as follows. H.264 at a minimum of 25 Megabits per second for HD transfers. DVD utilises the MPEG-2 format for compression, which requires less space than editing formats such as DV-PAL so for example a 50ft reel encoded with DV-PAL would require nearly 1000 Mega Bytes of computer storage. If you were looking to transfer 600ft or more of cine film into video editing files, then we would recommend the use of an external hard drive. If you decide to use our cine to DVD conversion option for transferring your 8mm or 16mm films to DVD, then you use ripping software to lift the tracks from your DVD’s. The final video quality will not be as high as us providing you with the raw video files from the outset. 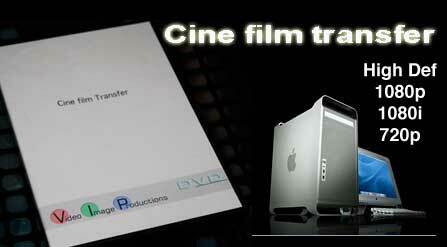 The advantages of cine to digital transfers are flexibility. Firstly you can edit the film yourself. The other advantage is the abiltly to upload your films to YouTube and other Social media platforms. Please remember that we also provide cine to DVD conversion.